The Asian or oriental pear has been in America since the late 1800s but it’s only in the last decade or two that enough trees were planted to provide for commercial production. These pears, sometimes referred to as oriental pears, Chinese pears, or Japanese pears, are considerably different from the better known regular pear varieties like Bartlett, Bosc and Anjou. Asian pears have a distinct but pear-like taste and a crisp texture, much like a good apple. Many Asian pear varieties also have an apple-like shape, and this combination of taste, texture, and shape causes many people to refer to them as “apple pears.” They are sometimes also called “salad pears” or “sand pears.” Their flesh is crisp, sometimes pleasantly gritty, and always sweet. They do not have the buttery flesh of ripe European pears. I love them in salads and here is one of my favorite recipes. If Asian Pears aren’t available use tart-sweet apples, regular pears, mangoes or whatever else is best in the market. In a large salad bowl, whisk the lemon juice, olive oil, shallots, honey and salt and pepper together. Gently toss the arugula to coat it with the dressing. Add the pears and toss them with the arugula once or twice. 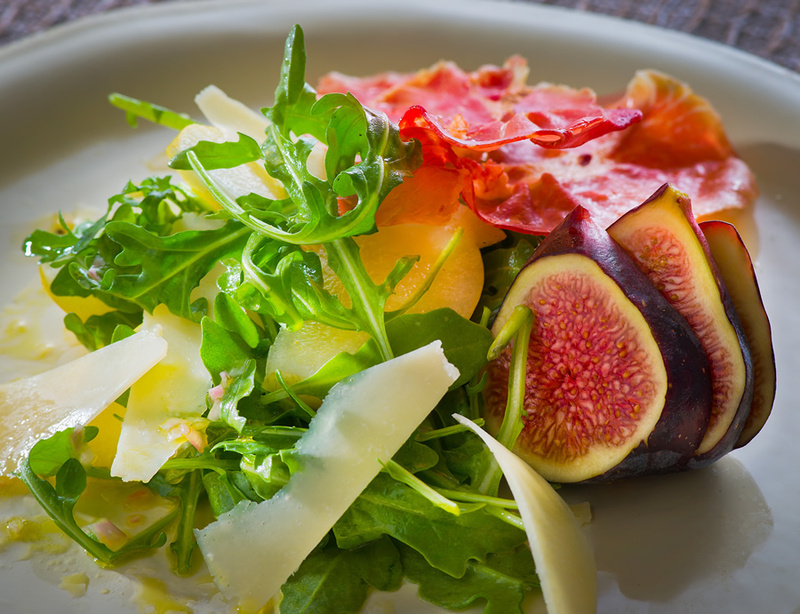 Arrange attractively on plates with the figs and top with the cheese and the prosciutto. Heat the oven to 375 degrees. Set a rack on a rimmed baking sheet. Lay prosciutto on rack and bake until crisp, about 8 minutes. Let cool then break into shards and chips.